A Zombicide Core Game OR Prison outbreak box is needed to enjoy the zombie-fest of this expansion. Take on the role of a Survivor, each with unique abilities, and harness both their skills and the power of teamwork against the hordes of unthinking, blood-craving zombies! 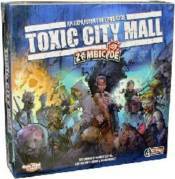 Toxic City Mall, an expansion for Zombicide, takes you for a shopping spree you won�t soon forget with 4 brand new Survivors and 10 mysterious Zombivor heroes. Play 10 missions (including 4 with the Prison Outbreak core game) with new tiles and new Equipment (hollow-point rounds and flamethrower included). Meet the dreaded Toxic Zombies, explore new depths of power with the Ultrared mode and super weapons, and play dead with Zombivors! It contains new features to expand your Zombicide games and enrich your experience with new friends and enemies, as well as new game tiles, equipment cards and rules. -43 miniatures including 4 new survivors in their human and zombivor versions, 29 Toxic Zombies miniatures and the Zombivor versions of Season 1 survivors. -Tokens to improve your missions, such as barricades and rubble coming in two sizes to block paths and maximize the tactical aspects of your missions. -New rules and game modes such as Zombivor rules, how to play dead, and Ultrared mode to reach superheroic levels and use the marvelous Ultrared weapons.